"Oh honey - it's gorgeous - I love it! And the meaning!" I swooned, immediately placing the thin bangle on my wrist, the charm dangling with glamour as I admired the new piece of bling. Alex and Ani jewels are an awesome gift to give or receive. At just the right price point, they are comfortable and light weight, don't fade, have thoughtful meaning and can be paired with existing pieces or worn on their own. The collections are growing every month, and more and more places in KC are carrying them, including Nordstrom (because everyone needs an excuse to visit). So far my collection includes a monogram or two for my boys and a lotus flower from a gracious friend, who knocked me off my feet with the little slip of paper that indicated the meaning behind it all. What a great reminder that far too often we don't share with others or take the time to reflect on... and right on your wrist! Sure beats those rubber bands you snap on yourself to recall things, huh? 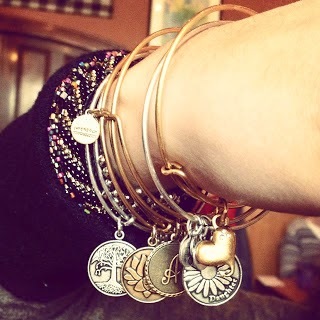 So spoil a loved one or splurge on yourself and check out the hundreds of Alex and Ani options. It's a darn good option, dangling right in front of your face...and from your wrist.